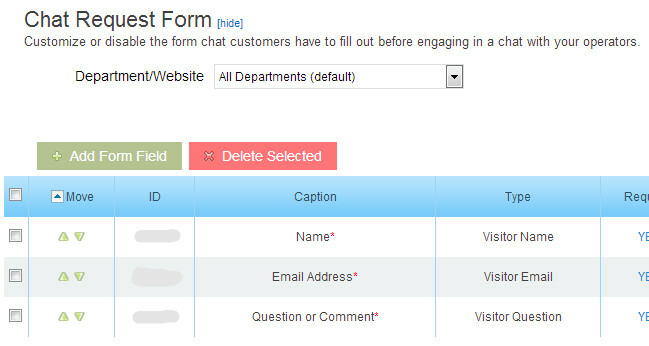 We added a bit more flexibility to the way chat request forms can be set up and used. Prior to this update, chat request forms could not have Name, Email and Question disabled or removed; only customized to have a different label. Now each of the 3 are editable, sortable and removable. All 3 of these fields are in your chat request form by default and have to be edited through this section to change. You can delete the fields, edit them or sort them, same as you would the custom added fields. These fields can also be pre-populated from information on your website by using the ID column as outlined in this blog post about hidden fields and pre-populating fields. This entry was posted on Thursday, February 14th, 2013 at 4:11 pm	and is filed under Features, News. You can follow any responses to this entry through the RSS 2.0 feed. Both comments and pings are currently closed.